I'll introduce some techniques of "name"-creating. 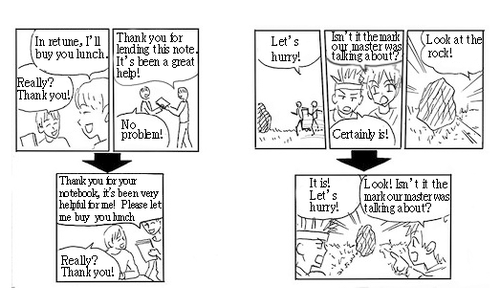 "Name" is a kind of a storyboard and the second stage of manga-creation. It requires various techniques. How to create a "name"
A "name" is manga which is roughly drawn on thin paper by pencil according to the plot of the manga story and character sheets. The "name" is different from the original meaning. "Name" has become jargon in the Japanese manga industry though I don't know how it became so. A "Name" is not merely rough sketching before working on drawing pictures on special thick paper for manga in earnest. It's a very important process to convert the plot into manga. The charm of the content is mainly created through the plot-creation, character sheet creation, and the "names" creation. If your work is boring at the "name" stage, it's almost impossible for your work to recover from the boredom at the following picture-drawing stage. Good capability of drawing "name" is required to create attractive manga. Usually, such "names" are supposed to be redrawn partially or entirely as needed to make them more interesting or charming. Therefore, the pictures should be drawn roughly to save time and energy. There are three ways of converting the plots into "names". First, let's prepare thin white paper like B 5 sized copy paper and mechanical or regular pencils. Method 1 : The first method is to convert the plot into name directly. While reading the plot, you draw the "name" on the paper with considering the characters' words in the speech balloons, the layout of frames, and the composition of pictures. Method 2 : The second method is to first convert the plot into more detailed text like a scripts, and then, convert it into a "name". Method 3: The third method is to convert the plot into a "mini-sized name" first. You can decide the size of the mini-name. I usually divide B4-sized paper into eight panels in equal size and regard each panel as one page of a "name". The mini name can be drawn rather roughly because it would not be shown to anybody. It's created just for preparation for the final "name", so, it's OK as long as you can understand the content. 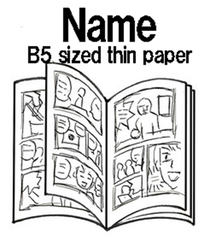 After finishing the mini-name, you can draw the final "name" on B 5 sized paper while referring to the content of the mini-sized one. Please click the picture to enlarge it. Compared with method 1, method 2 or 3 might seem complicated, however, method 1 can be difficult especially for beginners, so, sometimes it is faster to use method 2 or 3. All methods are used by professionals, therefore, you can decide which one is to your taste. 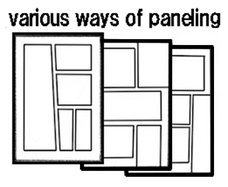 It's said that the average number of panels per page is around 6, so, from five to seven would be desirable in general. When it comes to the highlight scene such as a climax, the number can be lessen to create larger panels. Compared with old manga, the number of the panels per page has been reduced recently, therefore, it would be eight at most. Manga readers tend to get tired when similar patterns of layout continue but manga learners sometimes have difficulty in thinking of various patterns of the layout. To avoid it, you can sketch many layout patterns of professional manga. There might not be ones which just suit your need , but, if you see the sketches just before you work on "names", it somehow makes it easier for you to come up with variations. It's also important to take care of composition of pictures in every double-spread page in a "name". All picture composition in every panel in one double-spread page should be different from each other. If similar composition of pictures continues, readers tend to get board. If you are a beginner, it might be difficult to do so. Then, you can avoid similar compositions to some extent by only using "long shot" and "close shot". In addition, you can use manga by professionals as reference, too. Please sketch roughly as many composition of pictures of professional manga as possible. Just before you begin to draw a "name", you can take a look at the sketching as references. It would stimulate your sense of composition of pictures and you would be able to draw better. 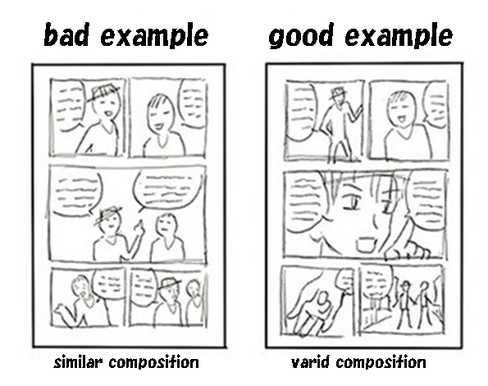 In case you are going to make your work public in some ways, you shouldn't draw pictures using exactly the same compositions of professional manga pictures since it can cause problems. You can only use them to get the hints of compositions. There are several ways to express a scene change. You should make readers notice scene changes using one of the following methods or combination of them. Method 1: Widen the room between the two panels where a scene change occurs. Method 2: Place one panel in which there is no picture where a scene change occurs. *This method tend to be used in "Shojyo manga", manga for teenage girls. Method 3: Place one comparably large panel in which a background is drawn where a scene change occurs. Method 4: Place one comparably large panel in which a background and words which would explain that the scene has changed or time has passed such as " Three days later, at her house" where a scene change occurs. Method 5: Use some close-up items to show a scene change. For example, if you want to express the place of the scene has changed from a classroom to a coffee shop, you can begin the new scene with a picture of close-up coffee cup, and it should be followed by a long-shot of inside the coffee shop. You can also use some of the techniques together. Manga-learners tend to use too many pages or panels considering the amount of the contents of their plots. In other words, they need to acquire a shortening technique. The easiest way is to check two panels in a side-by-side position whether their contents can be combined into one and expressed in one panel. Sometimes even the contents of three or four panels can be re-created into one panel. Depending on the situation, even one happening consists of two or three pages can be converted into one or two panels. However some learners have a tendency to draw very short "names" which abbreviate things too much. Mostly such "names" lack necessary explanations, so, the whole situation of the story is not understandable. I recommend you to notice which type you belong to and try not to be so. To tell the truth, there are many amateur manga artists who can draw pictures like professionals. However, in many cases, professionals surpass amateurs in creating plots, characters' personalities, and "names". So, if you really want to be a professional, you need to train these abilities. Even in Japan, you can seldom find manga-drawing books which deal with techniques related to these important factors. I have much more information about manga-drawing, so,I hope to publish my manga-drawing book overseas someday.